Typically scattered and chaotic as I am, I am constantly revising and re-imagining my approach, postponing and aborting and editing ideas. But I am continuing to develop the setting (and its atmosphere) despite my lack of posts. The Lowlands (previously the Northern Marches) are rustic and uncouth outlands at the edge of the wilds. Its inhabitants speak in a guttural bastardised version of the Imperial Speech known as the Meagre Tongue. There is little contact with the Seventh Empire from whence all civilisation and holiness springs. and hirelings that can be recruited. It should be noted that an inventory of basic items are available from every village - the special items and thehirelings are in addition to those in the basic inventory, the prices and crunch for which will be dealt with in a later post (if there is ever another post). All prices will be in groats as per the new copper standard I would like to implement. 1. Muttonwocky: A dreary and hopeless grey little cluster of Mud huts and animal pens where clandestine and taciturn shepherds clad in soggy sheepskins mutter superstitiously at outsiders. The drizzle is without respite and the stink is potent. 2. Gnathous Bremley: A sombre hamlet in a hard land of barren and frosty fields where starveling ropy swains break ploughs toiling to stave off perpetual famine. Venerable owls hoot by day from dead pine trees. Hovels of stone shelter gaunt and fearful cottars. None speak here but Grandmother Morag. 3. Auld Skerrick : Abandoned imperial Bastion on a mossy hillock in an empty land. Aged Lost Crusaders and Heretics-in-exile hide out among dark hills in this palisaded ruin. Archaic imperial cuirasses are still stored here as are scrolls with charms of barring-the-way and come-hither-thrall. Croaking ravens perched on the battlements sing ancient battle-hymns of the glorious past. 4. Scrope; on a sluggish tributary with six dilapidated toll-bridges is a crannog-village on stilts - an enclave of villainous and watchful watermen and a stork that can speak and a water mill that is choked with weed.Here there are also many wooden racks of smoked fish and a venomous fear that permeates everything. 5. Crowfork; Fierce and oppressive village of vigilant and superstitious crofters nigh unto the crossroads. Here there are whippings and hangings and heads on spikes, bloodthirsty militia-men and flagellants and pallid and fitful sunlight. There are bonfires on the ridges and dule trees and sullenly accusing goodwives. Fanatical priestlings stride hither and yon imprecating against imminent skyfall. 6. Throckbottle Copse: Here in a darkling grove with dirty snow on the ground are bodies stacked like cordwood and heresies afoot in wooden shanties. An ill wind blows and grindstones are always spinning, sharpening axes. Folk do not speak aloud here but whisper in corners and murder without conscience. 7. Flockenwhistle Abbey: Smoke hangs low in the valley of the Abbey and it seems always to be dusk. The brethren observe the canonical hours diligently within the mouldering hulk of stone. Fugitives and foundlings serve and are exploited by or parasitise the monastical inhabitants. The Abbess is a blind saint and her thurifers burn loathsome incense. 8. Foote: Sinking village lit by guttering torches in a foul haze at the end of long causeways above turnip fields drowning in the flood,. 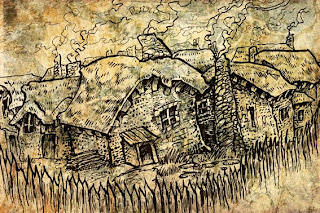 Filthy serfs are hauling sticks and stones to repair the crumbling causeways or crowd around battered cauldrons of nameless gruel under the muddy sky. Everything is rotting and sodden and mouldy. - Faded dun brigandine with basinet belonging to an imperial archer. Fantastic. Glad to see that Middenmurk still lives. Excellent! I'm working on a marshy lowland region for my own campaign right now, so I'll be prying suitable bits off of this. Thanks! Thank you all ever so much. Good to have you reporting from Middenmurk again, Tom. I love your naming of these places, it's wonderfully evocative. These villages give a very clear picture of the world you've created. Not just technology, or society, but also history and theology.